Brandon Burke. Image by Jan Andrysek. Three entrepreneurs in the O&P field who have their own personal experiences with limb loss to back up their knowledge speak to this greater motivation for impacting human lives, as well as the challenges they’ve had to go through to implement their concepts. 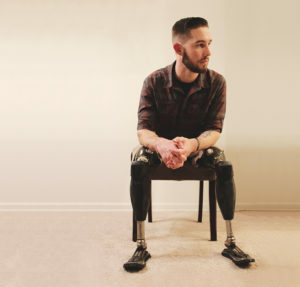 Jedidiah Morgan was in the Marine Corps deployed to Afghanistan when on June 20, 2012, while he was conducting a foot patrol, he triggered an improvised explosive device that resulted in the loss of both his legs above the knee and damage to his right hand. The Lords. Image courtesy of Randy and Lori Lord. This direct experience led Morgan to found Sergius Industries, a company that makes prosthetic and orthotic components, as well as the Amputee Repair Kit (ARK), which is similar to a first aid kit for anyone who wears a prosthesis. It includes items amputees need to care for their prostheses and residual limbs and comes in three sizes–home, vehicle, and travel. It was carefully designed to help prosthesis users achieve comfort and safety as their prosthetic components and skin constantly experience wear and tear. “Up until now, an amputee would have to purchase individual items for each type of maintenance or repair,” says Morgan. In 1985, Randy Lord, creator of the Amp Fin, had a workplace accident that crushed his right ankle. After two ankle fusions failed, he was left with the possibility of amputation. Four years later, he had his leg amputated below the knee, followed by a revision. All of this was devastating to Lord, who grew up in Maine and spent his life around, on, and in the water. In 1993, he met his wife Lori, who also grew up near the coast and loved the water. She wondered why he didn’t like to go to the beach and swim, knowing how much he loved the water. He replied that it was not fun for an amputee to walk in the sand, and once in the water, what’s there to do? Lori then asked what they could do to change this, which sparked their journey to create the Amp Fin. Over the next few years, they bought hundreds of fins at yard sales to cut them up trying to come up with something that he could use to get back into the water in a more enjoyable way. The business of their construction company put the project on hold for a few years, but in 2004 when they saw enlisted men and women returning from Iraq with all kinds of horrendous injuries including limb loss, Lord remembered the advice he’d been given by an amputee veteran: Attitude and patience is the key to getting through. He knew he wanted to help veterans and others with limb loss, so he and Lori began working on the project again, but with a much bigger purpose. “As an amputee, I know what other people with limb loss are going through, whereas others can only imagine,” Lord says. 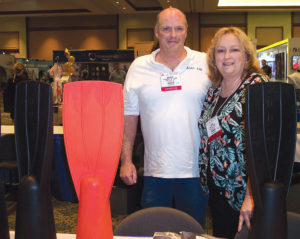 He and Lori unsuccessfully searched the internet for solutions, so they set out to make a fin by creating molds. After seven years of trial and error, they created a fin with no leverage or chafing issues and that would allow swimmers to put their prosthetic leg back on as if they had never been in the water. Finally, the Lords received their patent in 2014. The name Amp Fin stands for American-made Prosthetic Fin. In the developing world, 90 percent of lower-limb amputees don’t have access to a prosthetic device. Even those who do, often don’t get access to a high-functioning prosthetic device that can truly restore their mobility, enhance their quality of life, and enable them to return to school or the workforce. This is one of the reasons Brandon Burke helped found LegWorks, with the mission of enabling amputees globally to walk with confidence. Morgan. Image by Gabriel Morgan. Burke was diagnosed with stage IV Ewing’s sarcoma at the age of 16, which resulted in a limb-salvage surgery that eventually failed. At age 18, he underwent an above-knee amputation to return to an active lifestyle. The medical care Burke received helped him understand the privilege of living in the United States with access to world-class healthcare, and it also made him understand that the “best” isn’t always what is right for a person. LegWorks is focused on developing the highest-functioning prosthetic devices in categories of products that can be manufactured affordably and are durable, environmentally resistant, and low-maintenance. Currently, the company is focused on prosthetic knees with a line of products that utilize two novel technologies that Burke says significantly improve the functional capabilities of mechanical knees. 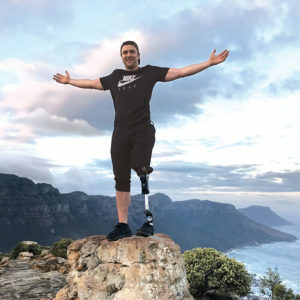 “I wear our product, the All-Terrain Knee, and it’s my ultimate vision that amputees globally, including the 90 percent that don’t currently have access, can not only wear the same knee as me, but that they can get access to the same complete prosthesis as me,” says Burke. It takes grit to be an entrepreneur, and for those trying to break into the O&P industry, the road can be particularly challenging. These three entrepreneurs are not alone in having encountered problems, limitations, and setbacks on their journeys, yet often that’s what ultimately inspired them to enter a niche market to try to solve problems for others facing similar challenges. Through their lived experience and a compassionate desire to help others, they are filling gaps in the market for others with limb loss and limb difference.